What is average salary in Chicago? Based on our survey (700 individual salary profiles) average GROSS salary in Chicago is US$ 84,666. Average NET salary is US$ 62,814. The most frequent GROSS salary is US$ 53,070. The most frequent education is Bachelors Degree. The most frequent experience are 20+ Years. Below is the list of 700 individual salary profiles - all added on this website. Bachelors Degree, 20+ years: "Responsible for day to day operations of a manufacturing facility"
Masters Degree, 20+ years: "Business development for process equipment manufacturer"
Bachelors Degree, 20+ years: "Teaching Reading, Language and mathematics to young children." Masters Degree, 12-16 years: "Special education teacher"
Bachelors Degree, 2-4 years: "Strategize projects from brief to completion"
Masters Degree, 12-16 years: "Senior Manager in Supply Chain and Operations Consulting"
Masters Degree, 8-12 years: "Providing support to Traders"
Masters Degree, 20+ years: "Diagnosis and management of medical illness in children and adults"
Masters Degree, 12-16 years: "Lead global intelligent automation program"
Bachelors Degree, 4-8 years: "? Coordinate the analytical and tactical side of import transactions, building supplier qualifications and financial risk databases in accordance with company policies. ? Decreased document processing times by 20% by introducing transactional activity metrics for the executive team; evaluated financial data to identify the relationship between operation and incoterm. ? Served as the Project Lead to implement a new purchasing system Microsoft AX; coordinated with internal and external customers regarding international shipments." Some College, 16-20 years: "Run several CNC machines"
Bachelors Degree, 4-8 years: "sourcing candidates, conducting interviews, scheduling interviews, hiring candidates"
Bachelors Degree, 20+ years: "Oversee marketing staff and independent contractors"
Masters Degree, 4-8 years: "Advise students on career development needs"
Masters Degree, 20+ years: "Consulting for customers on SW Dev"
Masters Degree, 8-12 years: "Manage teams and product strategy"
Masters Degree, 20+ years: "YES THIS IS TRUE"
Bachelors Degree, 0-1 year: "Weather stuff make reports and analyze data"
Masters Degree, 8-12 years: "assisting people in end of life care through bereavement, counseling, advocacy, and any resources necessary"
Some College, 20+ years: "Running everything"
Masters Degree, 4-8 years: "customer relationship, product marketing strategy, sales analysis, team management"
Masters Degree, 20+ years: "design & development electronic IOT and LED products"
Some College, 0-1 year: "Salary is actually 5000 annually because I am an undergraduate research assistant, part time, 7 hours/week"
Doctorate Degree, 8-12 years: "Managing and maintaining business operations." Masters Degree, 12-16 years: "Reconciliations, financial statement preparation, analysis"
Masters Degree, 8-12 years: "Teach 15-18 year olds about American agriculture"
Bachelors Degree, 8-12 years: "computational genomics. screening genes for single nucleotide changes"
Masters Degree, 20+ years: "I help publishers make complex book production simple by providing consulting, development, and training services." Bachelors Degree, 16-20 years: "executive in long term care field for large company"
Masters Degree, 1-2 years: "recruit potential student athletes that will come and run and throw and jump for our school." Bachelors Degree, 4-8 years: "Organize events and actions all across the city to challenge racism." Bachelors Degree, 4-8 years: "senior software security researcher a specific focus on ios/osx security." Bachelors Degree, 4-8 years: "Accounts payable, tax payment administration, scheduling and coordinating meetings Various projects as it relates to my department"
Masters Degree, 8-12 years: "create media from conception to delivery"
Some College, 4-8 years: "Manager customer service and oversee employees on a day to day basis." Some College, 1-2 years: "Help customers to find a Vehicle which best suits their needs"
Some College, 2-4 years: "I repair and maintain Vehicles." Bachelors Degree, 1-2 years: "Fixed income bond analysis Write credit research reports Build financial models Research relative value"
Bachelors Degree, 2-4 years: "Web sites and applications development." Bachelors Degree, 2-4 years: "Install medical devices, consult healthcare team on devices,"
Bachelors Degree, 2-4 years: "Insurance Insurance Insurance Insurance"
Bachelors Degree, 8-12 years: "Cost Control of Projects in Pharmaceutical"
High School, 20+ years: "Calibration / small to medium size projects." Masters Degree, 0-1 year: "Management Consultant, financial analysis"
Masters Degree, 12-16 years: "safety specialist at federal prison"
Bachelors Degree, 4-8 years: "I am a management consultant that specializes in mergers and acquisitions due diligence, with a focus on human resources." Masters Degree, 2-4 years: "technical writer: writing instructions online and manuals"
Bachelors Degree, 8-12 years: "Research Engineer - Mechanical Technician for X-Ray physics research lab"
Doctorate Degree, 12-16 years: "research assistant professor at university"
Bachelors Degree, 0-1 year: "New business strategy and implementation of revenue building techniques." Masters Degree, 20+ years: "Manage day to day activities within the company." Bachelors Degree, 20+ years: "obstetric nurse labor and delivery"
Bachelors Degree, 4-8 years: "electronics manufacturing company solidworks and other mechanical"
Some College, 20+ years: "Develop software for online and offline." Some College, 1-2 years: "painting landscapes and portraits painting/designing things in people's homes"
High School, 2-4 years: "Assess grain and assign official usda grade, data enrty"
Some College, 2-4 years: "I manage social media accounts (Facebook, Twitter, Instagram, Tumblr) and physical advertising for a video game company." Some College, 8-12 years: "customer support representative"
High School, 0-1 year: "My job consists of nothing more than making sure the gym is clean at all times"
Page 1 of 8, 100 of 700 salary profiles. 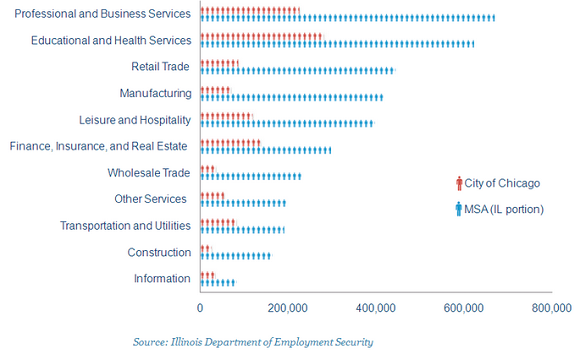 The economy in Chicago is among largest on the world and very diversified. It is an efficient economic center for more than 400 major headquarters. Chicago has various economic sectors that include manufacturing, risk management and innovations, IT, health services, and others. Average salary in Chicago is much higher than U.S. average salary. For example Experienced Software Developer earn around $87,000 on average per year. Average salary for IT Project Manager in Chicago is around $88,000. Executive Assistant earn around $51,000 on average per year.